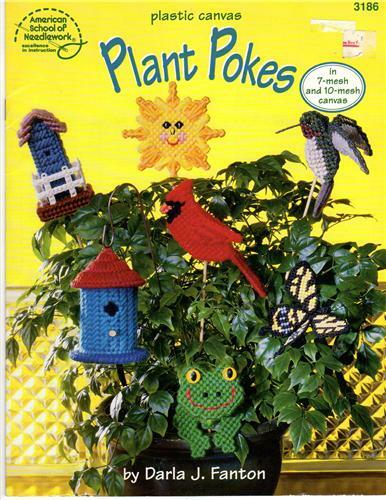 American School of Needlework Plastic Canvas Plant Pokes plastic canvas pattern booklet. Darla J Fanton. Uses 7 mesh and 10 mesh canvas. Golden Butterfly, Butterfly Beauty, Swallowtail, Crimson Cardinal, Cheerful Bluebird, Hummingbird in Flight, Purple Martin Birdhouse, Pretty Pink Lily, Round Birdhouse, Happy Sun, Trio of Violets, Sunflower in Bloom, Kitty Cat, Herb Seed Packets, Friendly Frog, Holstein Cow. 17 pages. Appears in new condition. Price tag on cover.